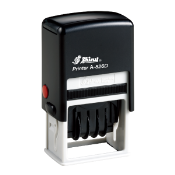 Light Weight Self-Inking Date Stamps for Office Use. Up toTtwo Lines of Custom Text Above the Date and Two Lines Below. Up to Two Lines of Custom Text Above the Date and Two Lines Below. Up to Three Lines of Custom Text Above the Date and Three Lines Below.